True confessions time: as of yesterday afternoon, I was four reviews behind. I have got to stop with this! But anyway, I tell you that mainly so you don’t think it took me until mid-January to see the latest Spider-Man movie (non-MCU). Well, fuller disclosure still, I originally didn’t plan to see it at all, since animated plus non-MCU made me think it was a Sony kid movie instead of a serious comics movie. But then early reviews were generally positive with a non-kiddy slant, and so there I was. 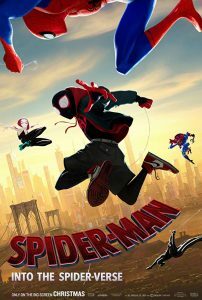 Into the Spider-Verse tells the origin story of Miles Morales, who you will remember from too many of my reviews to link to of Ultimate Spider-Man, after that time when Peter Parker got killed. Bendis did a good thing when he provided the Marvel Ultimate universe with a replacement Spider-Man, not just because Peter Parker had been the most important character in that continuity and the hole was painful, but especially because he provided someone who matched modern New York’s demographics. Not only does it embrace a broader audience, but it frees up a new story space, instead of just ending up with a clone of the original. I guess I jumped rather far afield. Anyway, the movie tells Miles’ origin story by way of Dumbo, while also introducing a concept I am decades from reading in print, about all the various earths where all kinds of other various people were bitten by radioactive (or genetically modified, or whatever) spiders, resulting in all kinds of new and bizarre Spider-People. This maybe sounds silly, but the Kingpin and his crew are collectively such a powerful threat that the cross-dimensional team-up actually feels necessary. Also: the little things they did with panel composition and lettering and the spider-sense were… a friend of mine said that he walked out of this movie with the knowledge that he had not previously seen a comic book movie, he had only seen movies about comic books. It really shows that the people who made this love not only the stories, but the medium as a whole. I really very much hope there’s a Miles sequel forthcoming. He deserves one, and so do we. I, uh, look. Shut up. It is important, comics being what they are, that I point out I mean clone in a metaphorical sense. Although a literal clone would be just as pointless. Oh, right. Kingpin is the big bad. He’s so much more effective here than he is in Netflix’s Daredevil. It’s not that Vincent D’Onofrio does a bad job, it’s that the Kingpin is a larger than life figure who translates to live action far less well than most other supervillains have done. This entry was posted in Film and tagged action, animation, comics, Marvel on January 15, 2019 by Chris. Like, sometimes I’ll be too busy to post reviews in a timely fashion. But this isn’t that. 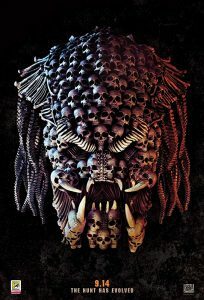 I went to see The Predator, and I liked it quite a lot. Army Ranger (or some other special forces guy) and a group of military misfits vs., you know, the predator. Right? 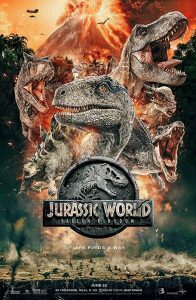 Lots of in jokes from previous movies (at least, from the original one), a cool autistic kid (which sounds implausible, but yeah, this may be the best use of a child in an action movie), a 90% valuable use of a token female scientist, plus lots of blood and explosions. To be clear, my standards are not very high. The movie is what it is, but this was a solid example of its type. My point is this: I liked the movie, but I still just forgot to write a review until I was thinking about watching a movie today. “Wait, I can’t do that until I’m not behind!” I guess I’m just glad I remembered at all? Popcorn is also a fine example of what it is, ie, empty calories that taste pretty okay in context, but it’s not like you’ll be telling someone in a week or so how great the popcorn you had last week was. Which is maybe what I actually thought about the movie? But I’m sticking with “I’ve been distracted.” Because I have, even if the other explanation is pretty valid too. This entry was posted in Film and tagged action, sci-fi on September 26, 2018 by Chris. You may recall that Wonder Woman was a solid movie, and that it gave me the impetus to watch the other DC movies I had skipped in the meantime, which, I mean, they were not abominations upon the face of the earth, but neither did they exactly inspire any more confidence in the DC train than the previews upon the basis of which I had originally decided not to bother. Still, now that I’ve watched the whole series, might as well watch Justice League, right? And it was fine. 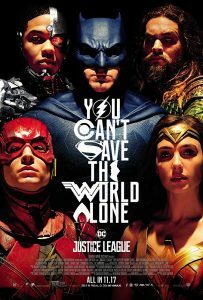 Better than anything besides Wonder Woman, and it had some pretty sweet musical cues at key heroic moments, but… well, it’s like this. You know how DC missed the whole point of what Marvel was doing when they decided that one movie was enough of a lead in to their team-up movie? By the same token, they missed the point exponentially moreso when their existential threat to the planet from space was introduced as the plot of an entire movie without ever having mentioned him before. Plus, I mean, Steppenwolf? That’s a band. But I still like the Flash, and like I said, it was mostly pretty good. It would just be better if I didn’t have ten years of Marvel to compare against, and if I weren’t snickering every time they mentioned the guy who is here to destroy Earth without also pointing out that he was born to be wild. And okay, technically that’s not how it went, they made like four movies total before Justice League. But Man of Steel was just another Superman remake when it came out, and I honestly think it’s more coincidence than design that allowed Wonder Woman and Suicide Squad to fall between Dawn of Justice and this one. Which ultimately means I’m shaping the facts to suit my narrative, but I’m not lying when I say it felt this way. Somehow, I didn’t review Man of Steel. That was an oversight. Also, let’s be honest, even though Suicide Squad is in the same continuity, it does not build toward anything here. It’s like a spin-off. This entry was posted in Film and tagged action, DC, HBOGo, superheroes on August 30, 2018 by Chris. As a Marvel movie, it’s, yknow, also an anodyne heist movie. 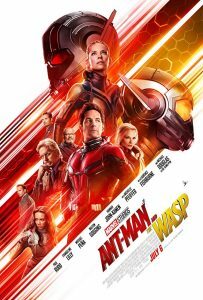 Better than Ant-Man, both in how it treated its heroes and its villains. Solidly middle of the pack as a Marvel movie overall, and considering that I like these pretty well as a collective, middle of the pack is good news for me! Also? Best blanket fort of all time. Including the one in Community. I’ve just realized that the internal physics of this pair of movies are irretrievably broken. This entry was posted in Film and tagged action, Alamo Drafthouse, Marvel, MCU, superheroes on July 23, 2018 by Chris. So, cool story, I saw a Deadpool double feature on Thursday. Which was only five six days ago, which means I guess I’m doing better than usual? Sigh. Anyway, I still like the first movie. I did not laugh as hard, because familiarity, but I still laughed. Later, they showed Deadpool 2, which I also liked. The short version is, it’s the same movie again. Yes, the plot is different, but it’s still Ryan Reynolds mugging for the audience and choosing ridiculous, hyperviolent solutions to problems whenever possible while Colossus looks on disapprovingly. Did I like it unreservedly? Nah, it had some problems. But even though the final act was too busy and muddled, there was a good story in there with at least one good character arc, and also I am really very much a fan of one of the new characters. So, muddled final act, problematic plot devices and all, I still dig this movie, and I’m pretty sure I look forward to a third one. But the first one is damn near perfect, and this was very much not. Oh well! It’s still funny. Can he grow and learn? I mean, maybe. Maybe not though. Another thing I hate about taking so long to review movies, aside from the guilt factor, is that societal reaction / consensus creeps into my opinions by now, and I don’t like it one bit. 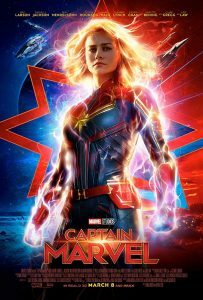 This entry was posted in Film and tagged action, Alamo Drafthouse, comedy, Marvel, superheroes on May 23, 2018 by Chris. Man, I screwed the pooch. It’s been what, two weeks since I saw Infinity War? In the meantime, it has been discussed to death, both with and without spoilers. Which is sad because it means probably that I can say nothing new, and anyway the only novel thing I had to say in the first place is kind of a spoiler. But, here we go nonetheless, since I pathologically can’t just not review the things, I can only feel guilty about not reviewing them. 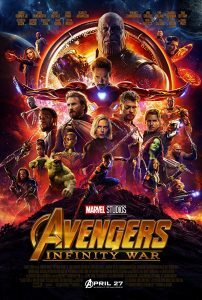 They have been calling this new Avengers movie the most ambitious crossover in history, ten years and eighteen movies deep. That’s not entirely right, because the first few movies leading up to the first Avengers did not foretell this. Not really. But as far as ambition goes, I cannot disagree. For the number of characters involved, none of them was ignored or given short shrift. (Not wholly true, as some characters were literally ignored by not being in the movie, but if they were in the movie, I mean.) And the pacing was great. In a world of modern action cinema where scenes cut every minute or two, this was divided into 10+ minute chapters focusing on the characters involved from start to resolution of a scenario (or at worst, start to nadir, with the next scene fully exploring resolution). It’s hard to remember that movies used to work this way, instead of snippets of individual strands that only weave together at climax. So, A++ for ambition and execution. I also liked the plot and most of the character beats, although I understand why some people did not. Basically, my point is: if you have invested in eighteen movies and a handful of optional TV series leading toward this movie, you should check it out. They stuck the landing. Spoiler-esque observation as first comment. Again, action / genre movies. I understand that your snows falling on your cedars always kept to that path. 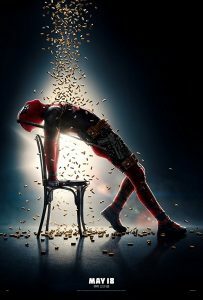 This entry was posted in Film and tagged action, Alamo Drafthouse, fantasy, Marvel, MCU, superheroes on May 10, 2018 by Chris. The single biggest problem with Tomb Raider as a movie is that it’s based on a video game. I mean, it’s based on the truly outstanding reboot of the original series, and that helps a lot. But it’s a really solid modern take on the 1930s pulp adventures serials, in much the same way that Raiders of the Lost Ark was a really solid modern take on those same serials when it came out in 1981, but this is nearly two generations later and so the modernism is taken up a few notches, is all. (Also, it’s not set in the 1930s, which, good call.) And to the extent that it was rushed and messy, that extent is because it was following the broad script of a game that you play for twenty plus hours, and yet was given only two hours to tell that story. The story is this: Lara Croft is a wealthy young heiress to a fortune about which she cares nothing; her only interest is in finding her missing father, who she refuses to accept is dead even though his estate is about to dry up from underneath her since nobody is in charge of it due to his years’ long absence. And she goes looking for him, but it’s one of those “goes looking for” kinds of stories where the person you really find is yourself. 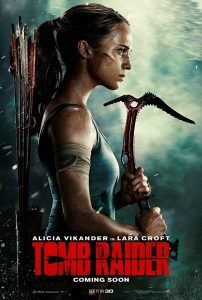 Will Lara Croft, rebellious twenty-something who spends her time kickboxing and racing bicycles become Lara Croft, globe-trotting, er, tomb raider? I mean, duh, but not in this movie. This movie is how she finds out those things about herself, while in the midst of drive-in movie mayhem. I wish I’d realized soon enough to keep up the drive-in totals, Joe Bob style, but I can assure you that there is a body count, faces melt, dicks get punched, the whole shebang. But since she starts off as a novice and ends up far from that space, two hours is maybe not enough time to really buy into her ability to survive on her own, take down an army of mercenaries, and solve archaeological and literal puzzles along the way. To be fair, that’s not entirely what the movie is about the way the game was, but it’s a little close for comfort. My prediction is that the sequel I’m hoping for will do better, since it won’t have to spend any time establishing her credentials, and since it maybe won’t be based on a different game (that I have yet to play, but maybe this year?). My point is, there’s a great series here, and if they realize it, it will be better than the pretty good movie I watched last night. This entry was posted in Film and tagged action, Alamo Drafthouse on March 20, 2018 by Chris. It took me until Monday night to see Black Panther, which was in a way annoying but in another way heartening. Tickets all Sunday afternoon and evening were sold out down to the front couple of rows, you see. This pleases me, both for the studio and the character. And not having seen it on Thursday night, it’s not like my review was going to factor into much of anything at all, so. The thing is, T’Challa is a compelling character and Wakanda is a compelling nation. There is a book that I have not read called Guns, Germs, and Steel that lays out an (as I understand it) compelling case for the idea that European dominance of the colonial and modern world has a lot more to do with geography and resources than with any innate superiority of its peoples. Enter Wakanda, a small African nation whose technology is far ahead of any part of the world not personally owned by Tony Stark, because that happens to be where a huge chunk of vibranium landed lo these thousands or millions of years ago, and the Wakandans happened to get there first. And you can say that this is so much wish fulfillment. Probably that’s true? But it’s awfully comfortable saying that if you happen to be the person whose wish was fulfilled by reality instead of the person whose wish was not. 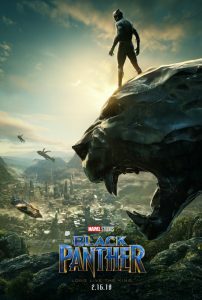 And to a large extent, that’s where my review ends, because as cool as the Black Panther is, and as fun as it was to see him rushing around the world fighting some of his biggest name enemies from the comics, and as well realized as his fellow Wakandans each were, and as socially and historically relevant as Killmonger’s origin story is, the real star of this movie was Wakanda. And they did that country up right, every bit as well as Asgard or Ego have been presented in previous MCU flicks. It’s what Captain America’s shield is made out of. More to the point, it’s virtually indestructible and has a number of rather intriguing properties in addition to this that make it a boon to scientific and military advancements over time. It’s, y’know, handwavium. This entry was posted in Film and tagged action, Marvel, MCU, science fiction, superheroes on February 21, 2018 by Chris.